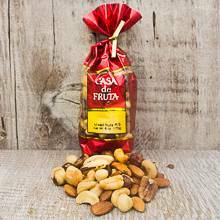 A delightful and crunchy combination of whole almonds, cashews, Brazil nuts, hazelnuts, and pecans roasted to perfection and then lightly salted. Bring these out next time you’re watching the big game! Packaged in a 6 oz. bag.